We have added a small version of Padre Pio medal and a Crucifix medallion (semiproduct is here). We have finished an interesting model of the Preborn Jesus medal and a big medallion Our Lady of Carmel. 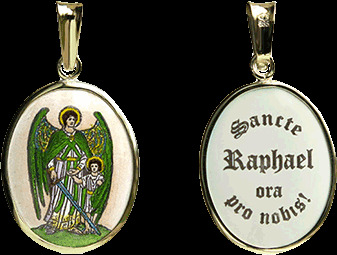 After archangels Michael and Uriel we have been asked to create a new medallion of archangel Raphael in green along with a brand new inscription. In the end of the year 2014 we finished medallion of saint Florian. After many of your inquiries we have decided to include a difficult - double side painted medallion with a special rotatable hanging to our offer. On the A side is painted Archangel Uriel and on the B side it is Archangel Michael. A new variation of Sacred Heart of Jesus with a blue cloak is here. We have added the biggest medallion of Our Lady of Lourdes with saint Bernadette to Larger Medallions. We have finished work on Padre Pio of Pietrelcina medallions. They are in two sizes and each size in two types of frames and have been added to our Larger Medallions and Classic Round Medals. We have started to sale of semi - rimless on our shop. You can find our hand-painted enamel elements for your own production of medallions in our section Without Frames. We offer our totally new product: Gold medal Infant Jesus of Prague. See in our Gold Pendants. Our last theme we have created is medal of Saint Cecilia - the patroness of musicians and Church music. You can find in our Classic Round Medals. We are adding a medal of Holy Agnes of Bohemia. You can find it in our Classic Oval Medals. 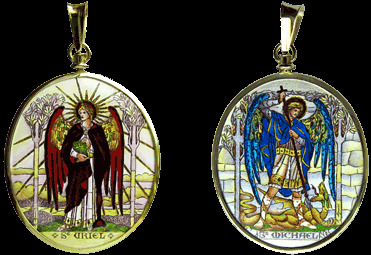 We fulfill our customer's wishes: the medal of St Michael is now in our Classic Round Medals. We prepared a medallion of St. Therese of Lisieux in the smallest size that we are able to produce. You can find it in our Miniature Medals. 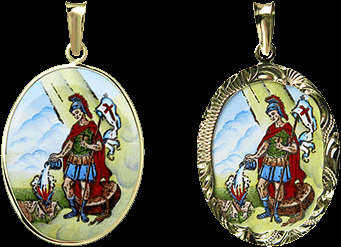 Medallions of St. Christopher - patron saint of travelers and motorists are already available. Were added to our Miniature Medals and Classic Oval Medals.